I have great memories of running races. I remember my dad talking me into running 5k's and the whole family would be out there. The Bridge of Lions 5k was in St. Augustine, FL. I ran as fast as I could trying to keep up with my dad. Couldn't keep up but still had my best time up until then. We had to walk back across the bridge to get to our car. I wasn't feeling so well due to pushing so hard. We still joke about how my mom offered me a tic tac to make me feel better! Another race I remember and really want to do again is the Tour De Pain. Three races in 24 hours: 4 miles on the beach, a 5k and a mile. The rest between each race gives you just enough time to be sore before the next one! I had my best mile time there even after running the other two races first. I quit running races through college and after graduating. I started running again just three years ago after having my second daughter. I needed something to help me get back in shape and lose the baby weight. I started running on my own, but it was tough and hard to get myself out there. I have always been hesitant to run with a group. I was always worried that everyone would be faster than me and just not be able to run my own pace. There was a running group at the YMCA that I was a member at. I had seen them take off as I plodded away on the treadmill. After enough boring runs on my own inside, I decided to join them. It turned out to be a great decision. If you have the opportunity to join a running group, I say go for it. It really gave me what I needed to get out there and keep going. Knowing you are meeting people, motivates you to get out there even when you don't want to. They push you past what you think you can do. They cheer you on when you need it. They become your best friends! 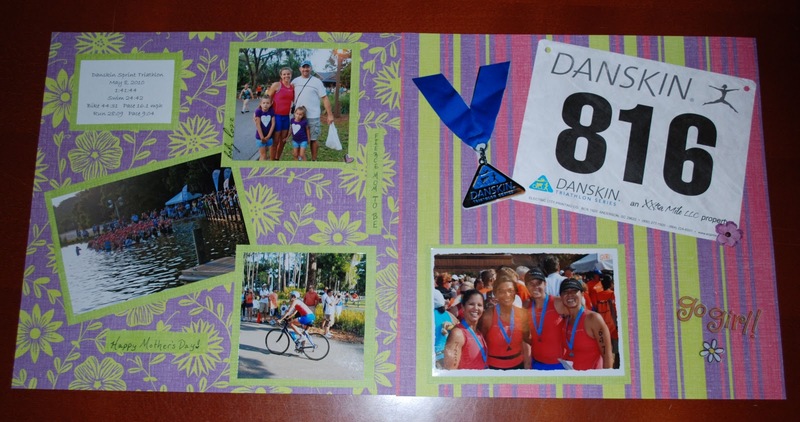 Danskin Sprint Tri - Announced my 3rd pregnany to friends at this race! ﻿ I've gone on to run many races including 5k's, 10k's, 15k's, triathlons, half marathons, full marathons, and even a marathon and a half in the same weekend. There are so many great memories attached to each race. 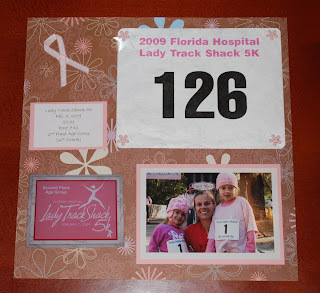 I always kept my race numbers and jotted my time on the back of it. So, I decided to get them organized and keep a scrapbook full of them. You don't have to be the best scrapbooker and it is pretty quick. 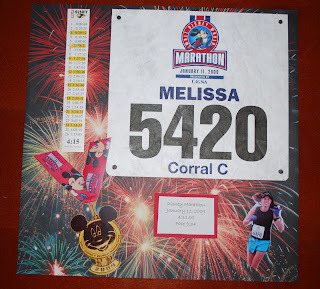 I use my number, photos, timing information, souvenirs, race flyers, picture of my medal or anything from the race. 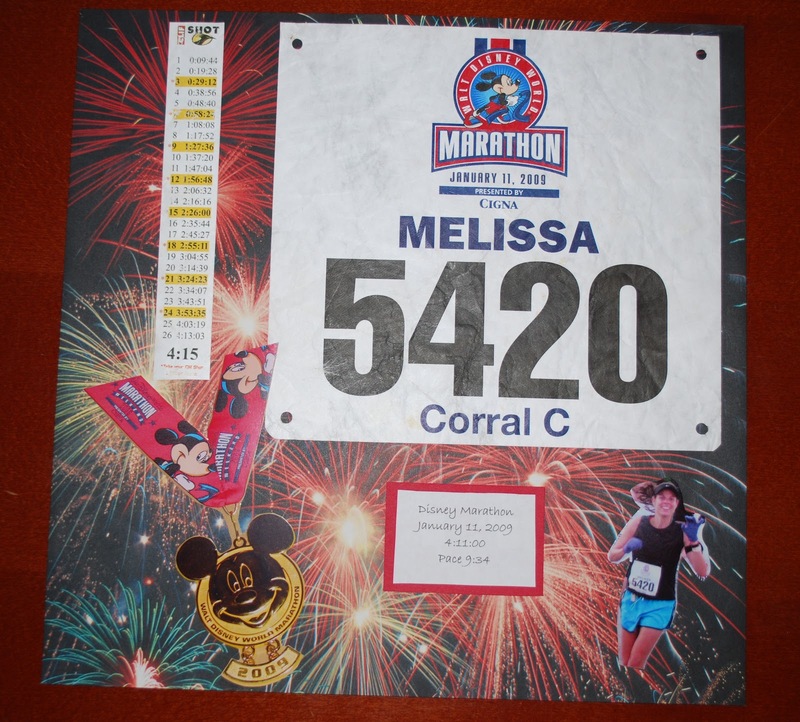 I usually do one page per race unless it is a big race, like my first marathon. Print out the race info with the race name, date, your time and pace or whatever is important to you. You could also write out the details of your run. I wrote out my whole experience for my first marathon since it is something I definitely want to remember. 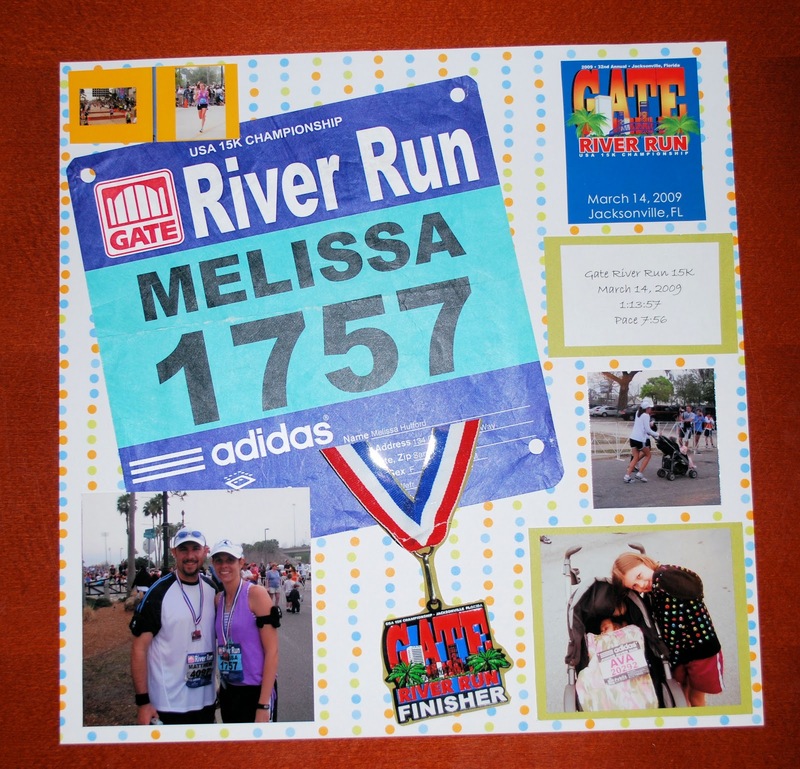 Take a picture of your finisher's medal or award. That way you have a record of it even if you don't have the room to save it forever. Of course there are tons of fun extras to add in the scrapbooking section of the craft store. Use the theme from the race and have fun with it! Since having my third daughter, I haven't been running as much as I was. It's been a bit disappointing feeling like I'm starting over, despite the fact that I continued running through my pregnancy. Looking through my scrapbook, it's good to know what I am capable of. I know I will get back there, but I'm not putting any pressure on it. I still run, but I do other classes as well to keep in shape and for fun. Everyone has different reasons for running races. Maybe it is for weight loss, may you run for fun with your friends, maybe it's for the competition. Track that in your scrapbook. A fun way to track your efforts and your results. Whatever your reason, a scrapbook helps to preserve each 'Runner's High' you get! This is exactly what I have been looking for! 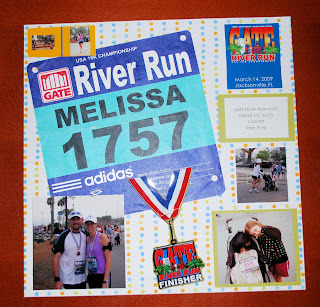 I have been wanting to do some sort of scrapbook to document our races. My 5 year old son is starting to run and our race bibs are stacking up. Now I know exactly how to preserve all of our running adventures. That's is so awesome that your son is running too. My girls love to race. I really enjoy looking back at the races we've done. Have fun scrapping!